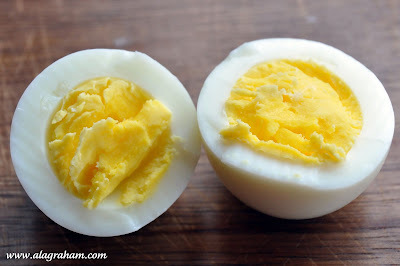 I love hard boiled eggs; one of the few ways I enjoy eating eggs. Right when I get home from the store I will usually hard boil a dozen eggs while I am unloading groceries. 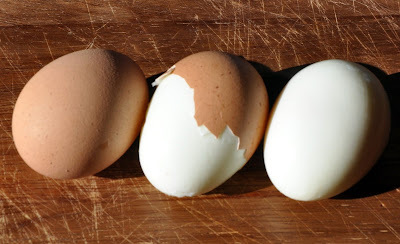 When they are cooled I throw them right back into the egg carton and mark it "Hard Boiled". Perfect to have on hand for a snack, to throw on a salad or breakfast on the run. Place 3-5 large eggs in a medium sauce pan, fill with water, covering the eggs by about 1 inch. Cover with lid and bring water to boil. Once the water is boiling, immediately turn off heat and let eggs sit covered in pan for 10 minutes. Drain the water in pan and run cold water over eggs until they have cooled down and you are able to handle them while peeling or store in fridge for up to 5 days. Note: You can boil larger quantities but make sure you use a larger pan, you want the eggs in a single layer and don't crowd the eggs. You may have to adjust the time. Sacrifice an egg at 10 minutes: remove it from pan, crack it on counter and slice in half with knife to see if the yolk is cooked to your liking. This is so spooky. 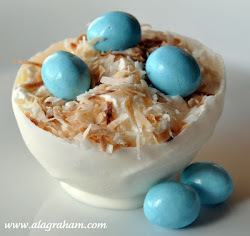 I just photographed the same color eggs, the same technique and I made egg salad! SIGH. I'll wait to post mine. Are you peeking into my kitchen? I also love to boil my eggs this way.